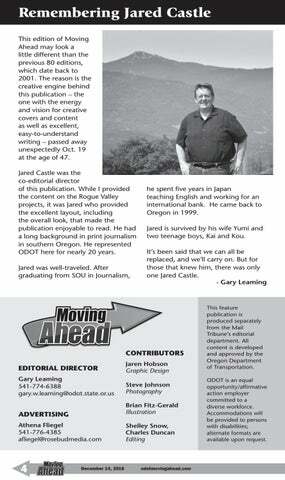 This edition of Moving Ahead may look a little different than the previous 80 editions, which date back to 2001. The reason is the creative engine behind this publication – the one with the energy and vision for creative covers and content as well as excellent, easy-to-understand writing – passed away unexpectedly Oct. 19 at the age of 47. Jared Castle was the co-editorial director of this publication. While I provided the content on the Rogue Valley projects, it was Jared who provided the excellent layout, including the overall look, that made the publication enjoyable to read. He had a long background in print journalism in southern Oregon. He represented ODOT here for nearly 20 years. Jared was well-traveled. After graduating from SOU in Journalism, he spent five years in Japan teaching English and working for an international bank. He came back to Oregon in 1999. Jared is survived by his wife Yumi and two teenage boys, Kai and Kou. It’s been said that we can all be replaced, and we’ll carry on. But for those that knew him, there was only one Jared Castle.